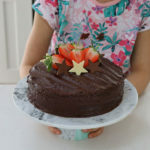 A delicious and easy recipe for Chocolate Fudge Cake made in the Kenwood Chef. Perfect to make for an indulgent treat this Mothers Day! Prehet the oven to 180c/170c fan. Grease and line two round cake tins (approx 20cm each). Attach the K Beater attachment to the Kenwood Chef. Mix the cocoa powder and boiling water in a mug until you have a smooth liquid then add to the Kenwood Chef bowl. Add in the flour, baking powder, sugar, butter, eggs and vanilla and start to mix, very slowly at first and then increase the speed until all the ingredients are well combined. Divide the cake mixture between the two prepared cake tins and bake in the oven for 25 minutes. Allow to cool for a few minutes in the tins before transferring to a wire rack to cool completely. In the meantime you can make the chocolate ganache topping by adding the chocolate, broken up into small squares and the cream to a large jug. Heat in the microwave to melt but be very careful to ensure that the cream does not get too hot. I do this by microwaving it in 15/20 second bursts, stirring and then repeat until all the chocolate has melted. Once the cakes have cooled add one of them to a cake stand and spread some of the ganache on top. Add the second cake on top of that and then cover the entire cake with the remaining ganache. Decorating the top is entirely optional but we added some sliced strawberries and chocolate stars. This cake will keep in an airtight cake tin for up to 3 days.